Join us for a day of volunteering at our Thomas Darling Poconos preserve! 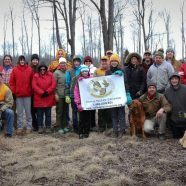 Scope of work: Come join Wildlands staff and the Ruffed Grouse Society as we advance our Golden Winged Warbler habitat restoration project and work to benefit many other wild plant and animal species by managing plants and new seedlings in the established restoration area at our Thomas Darling Preserve. Location & Meetup point: Volunteers will meet at the WAWA in Blakeslee at the intersection of RT 115 and 940 at 9:00 AM sharp. We will caravan to the Thomas Darling Preserve from WAWA. Please bring along gloves, loppers, any snacks you prefer and a water bottle. Wear warm clothes, gardening gear that you don’t mind getting dirty, and sturdy shoes or boots. The ground is uneven and you will be walking through brush. Lunch will be provided, as well as coffee, water and snacks. Please be aware: there are no facilities on the project site. Come see a beautiful and unique Pennsylvania landscape while aiding the efforts to promote a healthy habitat for the creatures in our watershed. A parent or guardian must be present if you are under eighteen years of age. Do you plan to come with a group? Group Name How many people? Is there an alternate email address we should contact?